Exams and Flash Cards from Your Textbooks! Flash Cards, Online and Desktop Exams For Your Police Promotion Written Tests, National and State Legal Exams and Assessment Center Preparation! 100+ Textbooks covered, up to 500+ Questions each! Our Mission: YOU - Landing at the TOP of Your Agency's Promotion List - and Getting the Promotion! Our printed and online Flashcards, Advanced Desktop and Advanced Online Exams are proven to be the BEST way for you to study and learn the material in YOUR promotional or legal textbooks. Start studying today! Even better - use our proven study system. See how many exam questions we have from your police legal and promotion textbooks. We offer you Advanced Online and Desktop Exams and online and PDF Flashcard Sets from any of the 100+ titles we cover, new and older editions. Included are up to 500+ questions per textbook, depending on the title and edition. We have exams from state and national legal titles, as well as supervision, management, administration, leadership, ethics, criminal investigation, field operations, community and problem-oriented policing, intelligence-led policing, and other popular topics. Advanced Promotion Testing Course - See all the features of our testing course, plus all the bonus items you receive! Police Promotional Exams - See all the titles for our textbook and state and local legal exams. FREE PDF REPORT - Ace Your Written Promotion Exam - Follow These 10 Steps to Written Exam Mastery! ENROLL NOW - and choose exams with up to 500+ real promotion questions from EACH of YOUR TEXTBOOKS! We cover all of the best law enforcement promotion and legal textbooks in use today, those used most often in police corporal, sergeant, lieutenant, captain, commander, inspector, deputy chief exams and higher. "Just wanted to drop a line to thank you for the services that your company provided me in preparation for the Sgt. test at my department. I finished 1st on the written test and 1st on the promotional list. I will be promoted next month. Your service really made the difference in me doing well, and help with my studying. "I used your flash cards and exam to study for the Constitutional Law portion of the exam. Got all those questions right. Great study tool!" Member - Washington D.C. Metro Police - Quoted with permission. "I just wanted to give some feedback regarding my experience with your site. I recently took a Sergeant promotional exam at my agency and used your website at the urging of some co-workers. I am happy to report I finished #1 overall and was immediately promoted to the position of Sergeant! "The flash cards were a great help in acing the detective test for my department, and the desktop exam was a great tool to help track my progress. Separate yourself from the rest of the pack - highly recommended!" "I had the high score on my department's Sergeant promotional test. The flash cards were easy to use and allowed for repetitive studying while on the go. I spent a lot of time going over the flash cards while waiting to pick the kids up from school or practice. Great investment!" Printed Flashcards - Study away from the computer! You will receive a complete set of PDF flash cards with all the questions we have for the title. Each flashcard provides the question, possible answers, correct answer, and the title and page number where the material appears. ONLINE Flashcards - Alongside the regular online exams, you can log in and use online flashcards! Use any smartphone, tablet, Chromebook, Windows or Mac laptop or desktop computer, any web-connected device with a modern browser - and you will log in to our Learning Management System 24/7 and use flashcards with all the available questions from your textbooks. With each question you can mark it for review, you can enter your own notes right on screen, and mark the time it takes to answer each question. You have complete control of which flashcards will appear; all the questions, just those questions you have marked for review, or just those you have gotten wrong 50% or more of the time. Advanced Desktop Exams are taken on a desktop or laptop using free Adobe Reader software. They are proven to help you QUICKLY learn the material in YOUR textbook! Paper-and-Pencil format exam. Print the questions from all the textbooks you are studying. Mix the questions together into one exam, make multiple copies, and randomize the pages each time you take it. Advanced Online Exams - You will use a dynamic and interactive LMS (Learning Management System) for your online exams. The LMS format is widely used to prepare for State Bar exams and in many other professional preparation courses. Use any smartphone or tablet, Chromebook, or any Mac or Windows laptop or desktop - use any web-connected device with a modern browser - and you will log in to our Learning Management System 24/7 and take these online exams covering all the questions from your textbooks! Take Your Advanced Desktop and Online Exams any time, 24/7, results are there for you instantly. Take the exams as many times as you need. Security and Privacy - We insist on total security and privacy. Look for the lock in the address bar. We have earned the McAfee SECURE certification. Results - Read all the testimonials from your fellow officers. You will achieve TOP written exam and assessment scores! We've helped thousands of officers rise to the TOP of the list and achieve their promotion. FREE PDF REPORT Ace Your Written Promotion Exam - Follow These 10 Steps to Written Exam Mastery! 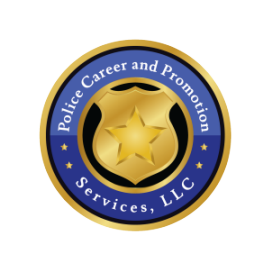 We are Police Career and Promotion Services, LLC, the National Leader in police promotion preparation for law enforcement officers. We are a company founded in 1985 BY police officers, FOR police officers! We provide professionally written promotional exams and assessment center exercises to police agencies. We write exams from only the best, major law enforcement textbooks - see our agency exam web site PolicePromotion.com. Included with any Flash Cards and Exams ... and available only to our clients. This video is not available from any other source. It was created for the exclusive use of our clients by the national leader in law enforcement promotion oral board preparation - Asst. Chief (ret) Bill Reilly of Finest's Professional Development. Read More about this included bonus. Attorney-Written Online and PDF Flashcards and Advanced Desktop and Online Exams from Your State and National Legal Textbooks. When you enroll in our Advanced Police Promotional Testing Course you receive a discount on the 2nd through the 8th complete set of exams, can enroll for 30 days, 90 days or as long as 6 months, and receive FREE and BONUS items! There is no waiting for the U.S. Mail! Flash Cards and Advanced Desktop Exams are delivered to your email as PDF files to start using right away! With the Advanced Online Exam we will email your login link, user name and password. 100+ Police Promotional Textbook Exams - Online and PDF Flash Card Sets, and Advanced Desktop and Online Exams from all the BEST Promotional Titles in use today! Listed below in alphabetical order by title.